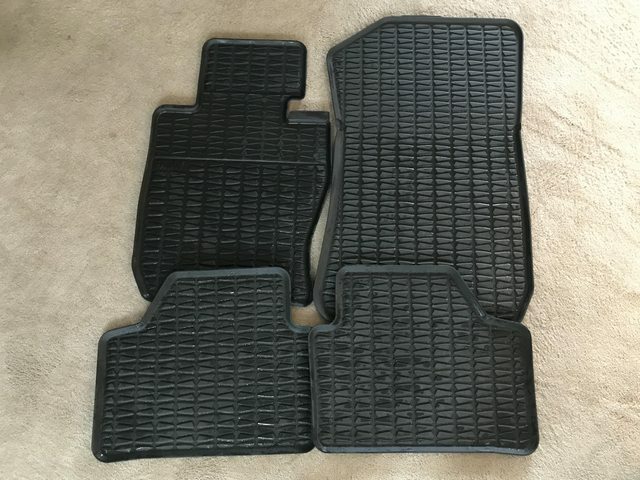 Selling a set of 4 all-season mats for an E84 X1. Perfect shape, just cleaned. $43 firm + actual rate USPS Shipping. Please PM me your ZIP for a quote. Last edited by burnout8488; 10-09-2018 at 11:17 AM. Bump, final price drop due to high shipping rates. How much were your shipping rates? I have a spare set of beige carpet I need to post, planned on stuffing them into a large flat rate box though. West coast was around $40+ for USPS, East coast closer to $20 I believe. The rubber mats can only be rolled up so much, and they are extremely heavy. Your carpets should be a lot cheaper to ship! Bump because Winter is coming and these don't fit in my Prius.